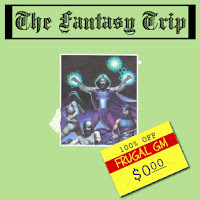 If you were familiar with the old The Fantasy Trip game from the old Metagaming Concepts company, I don't want to mislead you into thinking that this week's Free GM Resource is that game. 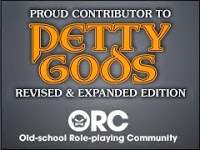 Instead it comes from a tribute site called TheFantasyTrip.org which seems to be run by Dario Corallo, who is an artist for Dark City Games. I could be wrong about that, but at any rate I wanted to make you aware of Dario's most excellent paper miniatures. On the website are some great paper minis of orcs, kobolds, adventurers, and a small array of other humanoids. The art is good and I like how he arranged them so each figure has a back. A lot of paper minis have a full-color "back" to them, but I prefer a simple shadow. As a GM I could simply use the shadow side to depict figures the party is aware of but haven't identified. The way I figure it, when the artist uses the shortcut of not providing a fully rendered backside of a paper miniature, that means he has more time to work on another figure! I've seen much more highly detailed artwork on paper minis just as I've seen even more "cartoony" artwork. These figures seem to strike a great balance between the two and should be a welcome addition to any GM who likes to use paper minis. I know I'm on a bit of a paper mini kick right now, but these are a real good resource for the Frugal GM.